A year ago today I turned a few old clementines into quick bread, snapped some poorly lit photos, and wrote my first blog post. Christmas break was long gone, and I was suffering extraordinary January teacher blues during what was already a rough year. I spent a lot of time reading food blogs, and one night while perusing my usual list, I whined, "I want to write a food blog." "Well, write a food blog then." Adam said, matter-of-factly. "But there are so many good ones already out there," I whined again. "Ok, fine, don't write one then." You can see how endearing I am to live with. I whined some more, and thought some more. I'd been reading Lara Casey's Make it Happen blog posts at the time, and she challenged readers to think about how much time they spent browsing social media or watching t.v. instead of taking actionable steps toward projects and goals they care about. I felt challenged. I was also influenced by two other books I had read, Seth Godin's Linchpin and Brene Brown's Daring Greatly. Seth writes about the "lizard brain" or "the resistance," the flight or flight mechanism of our brain that makes us endlessly afraid of failure. It's stronger and older than the part of our brain that allows for creativity, generosity, consciousness and art. The conflict between these two creates the "chasm between the part of you that wants to be safe and invisible…and the part which is demanding to speak to the world"
Brene writes about vulnerability. She says that "to put our art, our writing, our photography, our ideas out into the world with no assurance of acceptance or appreciation" is vulnerability. Yet so is "waking up every day and loving someone who may or may not love us back, whose safety we can't ensure, who may stay in our lives or may leave without a moment's notice, who may be loyal to the day they die or betray us tomorrow." Yet would we want a life without love? Brene says that "if we want to reclaim the essential emotional part of our lives and reignite our passion and purpose, we have to learn how to own and engage with our vulnerability and how to feel the emotions that come with it." These two books fundamentally altered the way I looked at the world. It took me a few months to work up the courage to act them out in my own life, and it's still a daily struggle, but I realized I didn't want my life to be ruled by fear or comparison. I wanted it to be ruled by faith, vulnerability, connection, and love. So, I started a food blog. This might seem silly to you, and not scary or vulnerable at all, but for me, it was. I was scared that people would think my writing was bad, (at times it was) or that the photos were ugly (they definitely were) or that my recipes were gross, (always possible) or, very worst of all, that no one would read, or click, or care at all. But, I stared all those fears down, and I did it anyway. Because food fires me up. Planning it, preparing it, chopping it, cooking it, baking it--but most of all writing about it and sharing it with people I love, and people I've never met. To those of you that liked/commented here or on Facebook, Instagram, or Pinterest, to those of you that told me on the bus, in a classroom, or at a wedding that you liked the blog or made a recipe or shared one with with your mom/aunt/grandmother, THANK YOU. Thank you. Thank you. Your support and enthusiasm made me persevere in the moments when I doubted, moments when the lizard brain threatened to take over. But now friend, I turn to you. What's the thing that simultaneously excites and terrifies you? That fires you up and frightens you at the same time? That fills you up with passion and inexplicable dread? Are you already doing that thing now? Great! Keep it up! Are you still too afraid? What are some baby steps you can take to make that goal happen? My friend Stephanie, who is writing an amazing blog and pursing her dream of working in wedding planning/design. My friend Amber, who recently left teaching to pursue her small business and artistic ventures full time. Now, finally, I can talk about these molten chocolate cakes. These are, hands down, the best dessert I have made for the blog thus far. They're simple to make, impressive to look out, and absolutely ridiculous to eat. Adam and I just sat on the couch staring blankly at each other in a chocolate-induced comatose for at least ten minutes after eating them. I'm convinced that the peanut butter fudge sauce could make the world a better place. Seriously, if someone is angry at you, make the peanut butter fudge sauce and present it to them in a jar. They'll forgive you immediately, and possibly profess their undying love for you or your cooking skills. Valentine's Day is coming up, so you have a reason to make these for your friends, your boo, or yourself. 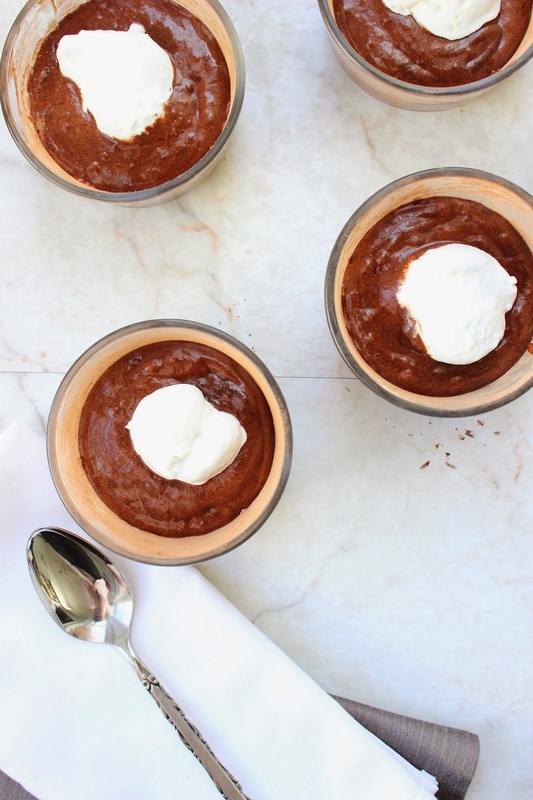 Combine 1 tablespoon flour and 1 tablespoon cocoa powder in a small bowl. Use butter to grease the inside of each ramekin, then sprinkle inside with flour/cocoa mixture to coat the sides and bottom evenly. Discard extra. Place ramekins on a baking sheet. 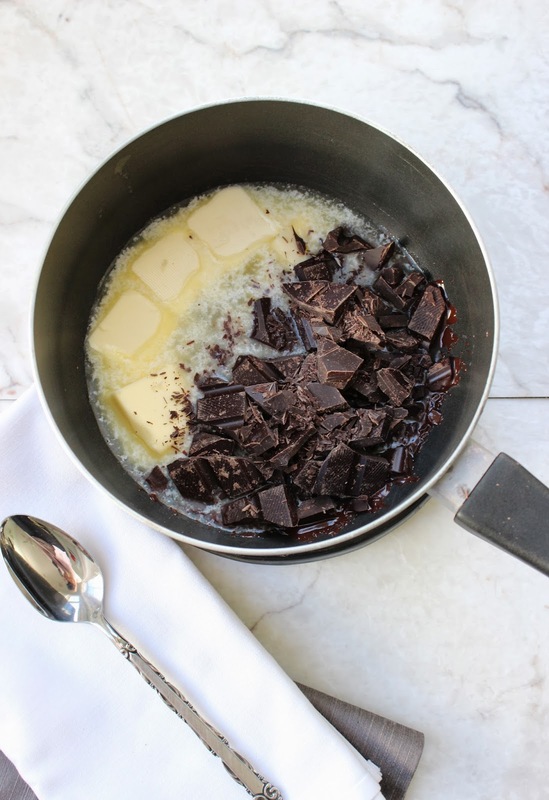 In a medium saucepan, combine butter and dark chocolate. Cook over low heat, stirring occasionally until chocolate is just melted. Set aside to cool. Using an electric mixer, beat sugar and eggs until thick and yellow. Gently fold in the melted chocolate and then 1/4 cup flour. Spread 2/3 of the batter into the prepared ramekins. Spray a spoon with non-stick cooking spray; then use that spoon to scoop about a heaping tablespoon of marshmallow fluff onto each ramekin. Cover with remaining chocolate batter and bake for 16 minutes, or until tops are cracked but the middle is still slightly jiggly. Let cool for 5-10 minutes and then run the tip of a knife around the edge of each ramekin. Invert over a plate and tap gently, using a pot holder if necessary. 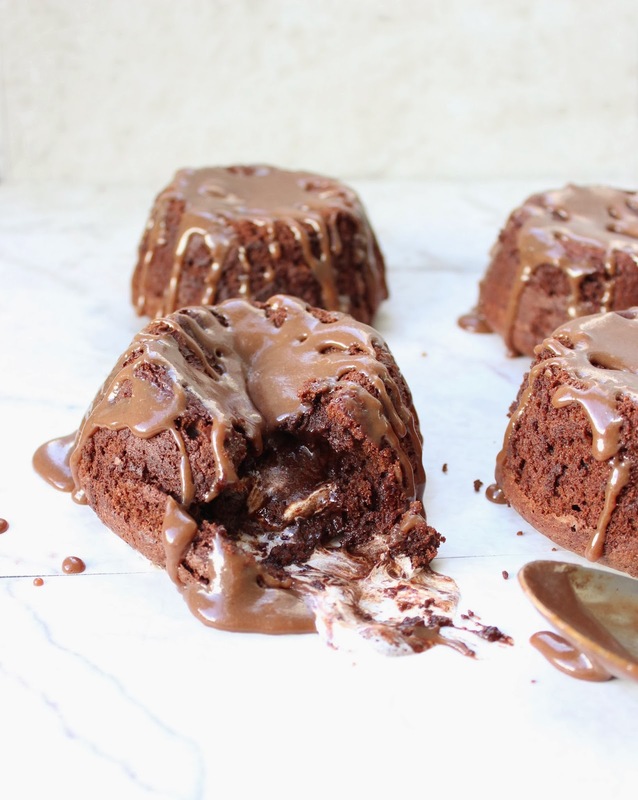 Drizzle with peanut butter fudge sauce and devour immediately. Combine milk, sweetened condensed milk, chocolate chips, and peanut butter in a medium sauce pan. Cook over medium low heat for 6-7 minutes until smooth. Remove from heat and stir in vanilla. Sauce will thicken slightly as it cools. *This can be made a day ahead of time and kept in the fridge. You'll have plenty left over to drizzle on ice cream or eat with a spoon! 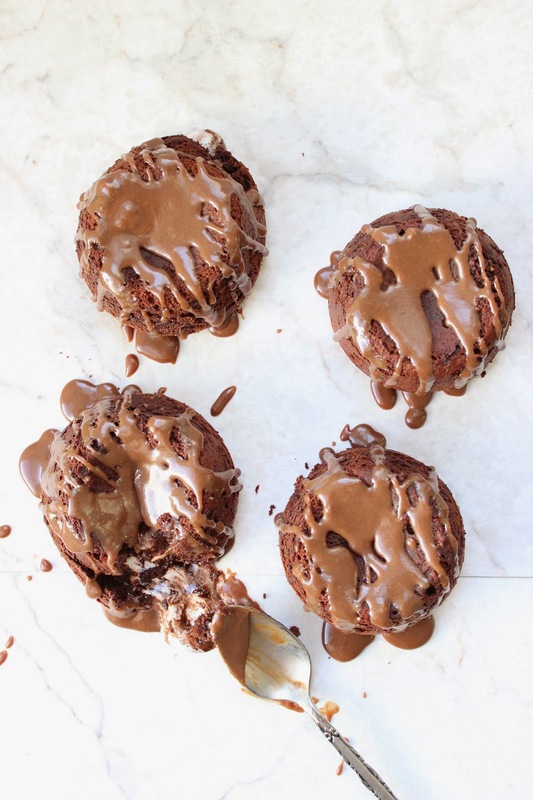 Molten Marshmallow Cakes adapted from Food and Wine. Happy Blogiversary Trisha! I'm so glad you got to write your blog! Thanks Consuelo! This means a lot coming from you because your blog is BEAUTIFUL. 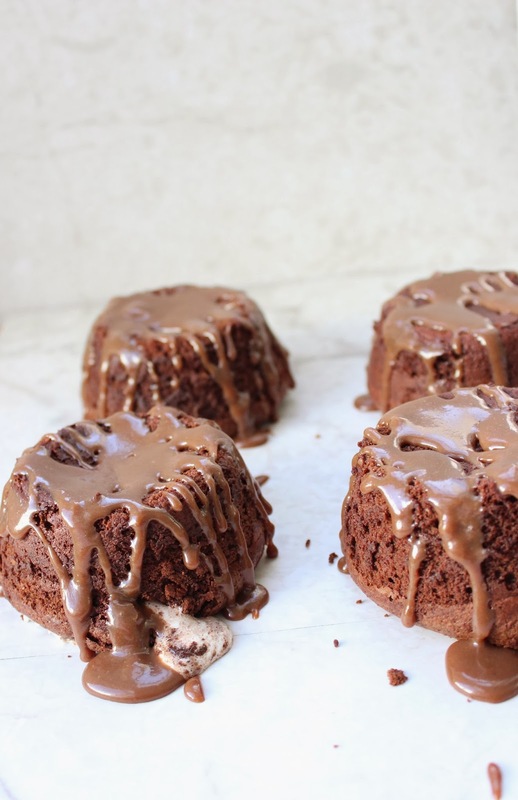 I'm swooning over these cakes and that peanut butter sauce. OMG what a glorious dessert. Well, I am definitely happy that you took that daring first step, because I love coming here and reading about your eats and the goings on in your life! Congratulations on an awesome first year...the first is always the hardest, I think. Also, molten lava cakes. And that fudge sauce. What a way to celebrate. Trisha, I know you posted this a few days ago, but I am so happy I am just now reading it. Today, I was doubting myself and my abilities. Thank you so much for your honesty and openness to share. I love looking at your food and trying our the recipes! Oh my! 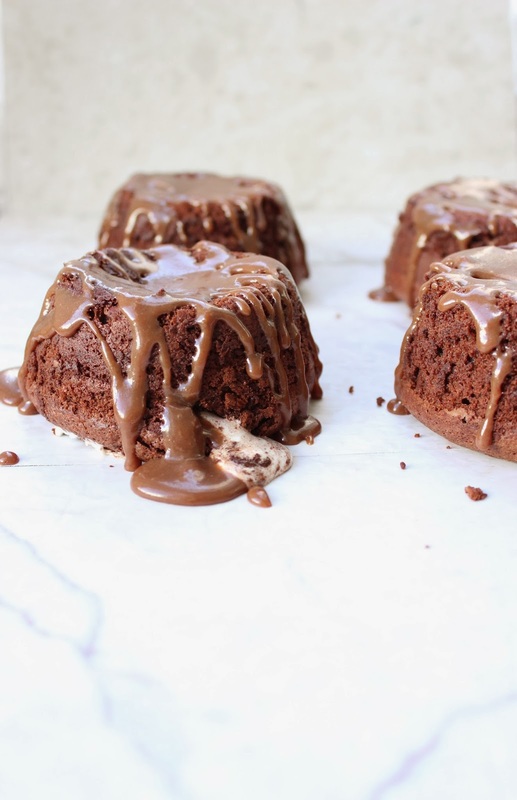 As if molten chocolate lava cakes weren't already awesome, these are amazingly awesome! Love the sauce!! Happy blogiversary! Is it necessary to eat them immediately?